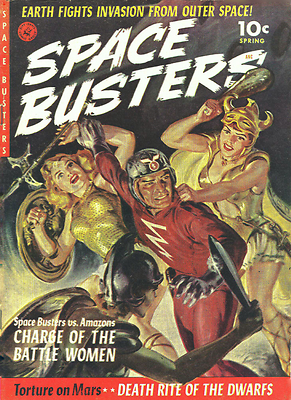 Hero Histories: Reading Room Annex: SPACE BUSTERS in "Charge of the Battle Women"
Reading Room Annex: SPACE BUSTERS in "Charge of the Battle Women"
Part Two of the Mars Campaign from SpaceBusters #1. Part One can be found HERE. It's a fascinating look at male-female relationships as shown in comic books of the 1950s, proving those Lois Lane comics and their attitudes towards women weren't an aberration. Tomorrow, the conclusion of the Mars Campaign! which also features SpaceMan Jet!